I took the Salesforce Architect Certification Self Evaluation exam recently. This officially begins my journey towards the Certification. To begin with, let me take you thru the self evaluation questionnaire so you all can get a rough idea of what it actually evaluates.. Similar to all the salesforce certification exams, you can register for the self evaulation exam in Webassessor. The pre-requisite for the self evaluation is either the App builder or the Developer (believe this is the old one and not the new Platform Developer I). The only change for this exam compared to other exams is this exam is not a proctored one. So you can simply launch the exam online from your webassessor account after registering for it. for the list of skills listed below. The only suggestion I have here is Please Be Honest with the skill assessment questions. I've given the scale I chose for each skill based on my experience. Finally, you have to give your number of Years in Architect role and Years with Salesforce Platform and provide couple of References from any of your projects where you played an architect role. I'm working thru my Platform Developer II certification exam currently (the first part - multiple choice exam is scheduled in couple of weeks time and hopefully I can complete the programming assignment in the next couple of months based on the exam calendar). If you are a long time technologist or getting your head way into the technology world, you will realise learning a new system or platform is not that easy. 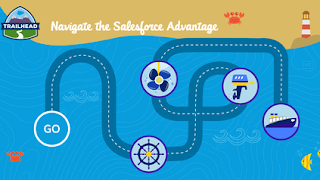 Salesforce was no exception to this, until Trailhead came in..
For anyone who goes thru these modules and projects within the trail, there is a real joy of learning and understanding the basics in a fun way. So go ahead and hit the trail to navigate your way to success !!! we are getting a nice hook to tag an Apex Class to run every time a sandbox gets refreshed.. Typically Salesforce Administrators or Release management teams, goes thru series of steps every time a sandbox is created or refreshed. Salesforce helped them to some extent by bringing in sandbox templates before.. taking it a step further, now they have added the ability to auto run an Apex Class once the sandbox is ready..
avoiding any automation in non production environments impacting customers. This feature will be more useful with Partial and Full sandboxes compared to Developer & Developer Pro sandboxes since we don't get any data being copied across with these 2. With the increased number of sandboxes available for the latest editions of salesforce, this is definitely a time saver for larger development teams using multiple sandboxes and going thru frequent refresh cycles in a project release. here's the link to the release note page with details..
Salesforce Global / Universal Picklist - Its Finally arrived..
With Spring 16 release, we are getting the long requested Global / Universal picklist feature.. Note it's still in Beta phase and hopefully will become GA in next release..
4. 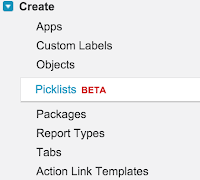 Now if you go to create a new custom picklist field, you will have an option to either select the values from a global picklist and enter your own values. 5. 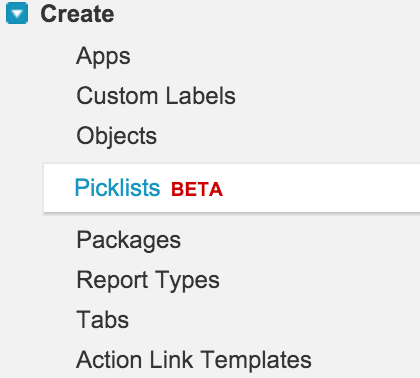 Give your new picklist a label and name, and choose the global picklist you created before as the source for values and you are done. Its been a while since Salesforce introduced the Custom Metadata Type feature..
if you are wondering how you can make use of this, here's a use case which I recently worked with. Create a custom metadata type called Integration Settings. Include Fields to identify which external system it is, which environment, and the other additional connection details like the endpoint url, username, password, timeout etc.. Create a Utility class method in Apex which takes the external system name we want to connect to as a parameter, and then identifies the current salesforce environment (say production or sandbox using the Organization details ) and returns the connection details for that system in that environment. With this, we don't need to ever worry about missing integration details during deployments or having incorrect urls in different environments due to sandbox refresh or migration custom settings data between environments or manually creating configuration details.